Market your app with the best high-quality mockups! Try out this construction mockup featuring a civil engineer holding an iPhone 6 Plus in portrait position while reviewing a checklist, you can simply drag and drop your image over the template and our mockup generator will have your download ready in no time. Get more digital mockups thanks to this incredibly easy to use mockup tool! Showcase your app work like never before in this great iPad mockup featuring a white iPad Pro in landscape position held by a civil engineer on the construction site, nice shot right? Imagine how great your app will look like in this photo mockup! Simply drag and drop your image over the placeholder now and our mockup tool will have your mockup ready in no time. Use this great onsite construction app mockup to display your latest work! You can customize this digital mockup by only adding one of your images onto the template, our mockup generator will have your final download ready in just seconds. Make your app stand out from the rest with this iPad mockup featuring a construction worker holding it in landscape view, pretty cool right? Create your own mockup now and start promoting your app like never before! You just have to place one of your own images over this great mockup template featuring a construction worker checking his iPhone in portrait position at the construction site. Go ahead and download more of our customizable mockups from our great variety of app mockup templates! App marketing doesn't have to be hard when you have Placeit on your side! Create amazing digital mockups in seconds thanks to our easy to use mockup tool, simply choose a mockup and drag and drop your image onto the placeholder, a download will be ready for you in no time, it's that easy! Your new app is going to look incredible in this black iPhone mockup featuring a construction worker at work. Start your app marketing campaign on the right foot with these incredible photo mockups by Placeit. You can customize more digital mockups in just a few seconds thanks to this easy to use mockup tool. Get more out of your budget when you use Placeit and save time from designing on Photoshop, all the iPhone mockups you need are right here! Like this construction iPhone mockup of an architect. Create a compelling visual asset for your latest app with Placeit! You can customize your own digital mockup in just seconds thanks to this handy mockup tool, take a look at this iPhone mockup in portrait position featuring a female civil engineer working on site, cool shot don't you think? Make more of your own mockups and promote your new iOS app with realistic mockups! Create your own digital mockup in just seconds thanks to our easy to use black iPhone Plus held in portrait position by a female architect at the construction site. All you need to do is drag and drop your image over the placeholder and our mockup tool will adjust it for you. No more struggling with Photoshop with this amazing mockup generator. Start your app marketing strategy the right way with photorealistic mockups by Placeit! You just need to drag and drop one of your images over the placeholder and your download will be ready in no time. Create compelling visual assets thanks to our amazing easy to use mockup tool, you won't ever have to struggle with Photoshop again! Make your app work stand out from the rest with this amazing mockup tool by Placeit, you can use digital mockups to create compelling advertising that will captivate your users. Simply drag and drop your image over the mockup template and this construction mockup featuring a young architect hold his iPhone in landscape view will display your app in no time! App marketing just got a lot easier with these incredible digital mockups by Placeit! You can customize this template by simply dragging and dropping one of your images onto the placeholder, you'll have a download ready in no time. Create more iPhone mockups in less than you can imagine and even cheaper than designing, you will love this mockup tool! Give your app a visual asset to stand out in! Try out this cool digital mockup of a woman civil engineer holding her iPhone Plus in portrait position while working at the construction site. You can place your image over the template and our mockup generator will automatically adjust it for you, you just have to download! Making your own mockups is now easier and cheaper thanks to our mockup tool. Get an amazing app marketing mockup with our easy to use mockup generator, all you need to do is add your image over the placeholder and in just seconds a download will be ready for you! 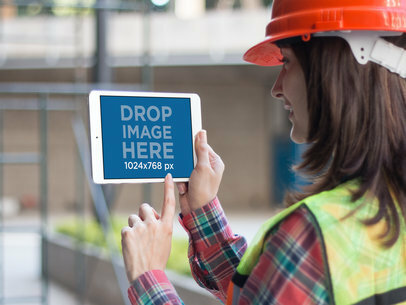 It's very easy to promote your new app with the curated visual assets, try this mockup of a female civil engineer holding an iPad mini in portrait position! Look at this incredible photo mockup of a black iPhone held in portrait position by a construction worker, pretty cool right? You can customize it with your own work by simply adding an image over the template, in just seconds a download will be ready for you, easy right? Get onboard with photorealistic digital mockups and create the impact you want on your clients! Captivate your clients at a glance with this photorealistic iPad mockup of a woman holding an iPad mini in portrait position on a construction site, you will love how real your app looks! All you need to do is add one of your images onto the mockup template and our mockup generator will have your mockup ready in no time! Save time and money from your app marketing strategy now. Stop struggling with Photoshop and start promoting your app with super easy mockups! This is the perfect visual asset to display your work and captivate your clients instantly, all you need to do is add your image over the placeholder and you're done! Get more digital mockups from our collection and build your app marketing strategy in no time! Make your work stand out in this great digital mockup featuring a construction scenario where a young woman architect is holding an iPad Pro in landscape position, your app can go perfectly with this mockup and o¡it only takes a few seconds to customize. Simply drag and drop your image over the placeholder now and our mockup tool will have your final download ready in no time! Check out this amazing photo mockup of a female architect at work holding her white iPad mini in landscape view, pretty cool right? Your app can fit into the screen by simply dragging and dropping your image over the placeholder, our mockup generator will create a download for you in a matter of seconds. All you need is this great mockup tool and you'll have an app marketing strategy in no time! Display your latest app work on this incredible construction app mockup featuring a female architect reviewing her blueprint at an onsite construction. You can customize this mockup by adding one of your own images onto the template, our mockup tool will start adjusting everything for you in a matter of seconds. Get more out of your budget when you use photo mockups to market your app! Start promoting your app with the best mockups! Use this great iPhone mockup of a female architect taking a picture with here black iPhone 6 Plus in landscape position, perfect for your latest construction app. All you need to do is add one of your own images onto the template and our mockup generator will have a download ready for you in seconds! Display one of your most recent apps on this great construction mockup featuring a female civil engineer using her iPad in landscape position out on the site. You just have to drag and drop n image of your app onto this mockup template and our mockup tool will adjust it onto the screen for you, easy right? Create more digital mockups for all your app work and impress your clients instantly! Use this iPad Pro mockup to display your latest app work in a more appealing way! Simply drag and drop your image over the mockup template and you'll have your customize construction mockup download in no time. Promote your work with compelling visual assets and see the difference right away, you can trade in Photoshop for this easy mockup tool and save up on money! What will your app look like in this amazing digital mockup? Simply drag and drop your image over this mockup template now and see for yourself! Get more out of your budget and create amazing visual assets for your app marketing strategy, you can customize more mockups in no time with this great mockup tool, for less money and less time! You can try mockups for a change and start doing your app marketing the right way! Go ahead and customize this digital mockup now by simply dragging and dropping your image content over this mockup template featuring a young architect using his iPhone in portrait position, perfect for a construction app don't you think? Keep boosting your strategy with this amazing mockup tool! Choose digital mockups for your next app promotion campaign and get instant results! 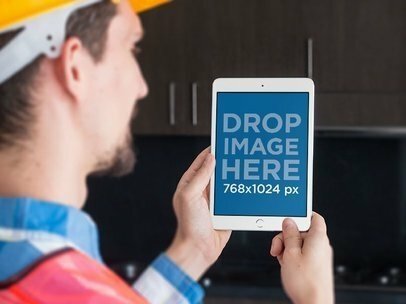 You don't even have to use Photoshop, all you need to do is drag and drop an image of your choice featuring your app and place it over this mockup template of a construction worker holding his iPhone 6 in portrait position, and our mockup generator will have your final download in no time! Time to update your app marketing strategy with these incredible digital mockups by Placeit! You can customize this template with your app now by simply adding your image over the placeholder and our mockup tool will give you download in no time. Isn't it easy to promote your new app with amazing visual assets? Now it is! Captivate your clients at a glance thanks to Placeit's incredible photo mockups! 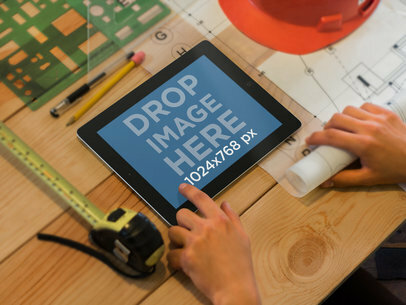 Personalize this digital mockup now and make and impression, all you need to do is drop your image over the mockup template featuring a civil engineer taking a picture with his black iPad mini in portrait position. Stop looking for more templates when all the mockups you need are right here. build your own app marketing campaign now! Create your own app marketing strategy with the help of photorealistic mockups, try out more templates from our mockup collection and test your app design on it! You can simply drag and drop an image over the placeholder now and our mockup generator will take care of the rest for you, easy right? All the mockups you need to promote your app in an appealing way are right here! 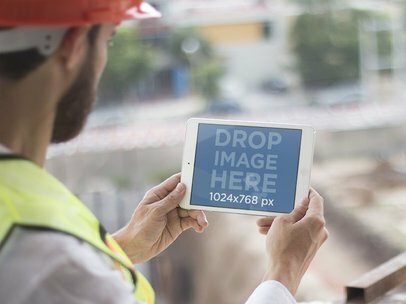 Make an impression on your clients with this great construction app mockup featuring an architect holding an iPad Mini in portrait position to take a picture at the construction site, cool right? Display your new app on this great mockup in no time and start saving money from your advertising budget. Use mockup for your app marketing strategy and notice the difference right away! Make your app advertising look realistic with these amazing digital mockups by Placeit! You can customize this iPhone mockup by adding one of your own images over the mockup template. Create hundreds of iOS mockups like this one of a construction worker taking a picture with his white iPhone, great scene for your app design don't you think? Start promoting your new construction app with realistic mockup templates by Placeit! You can try out this template featuring a construction worker checking his iPhone 6 on site, pretty cool right? 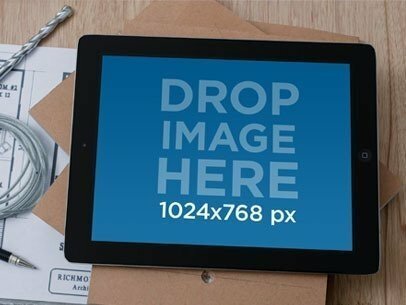 Simply drag and drop your image over the placeholder and our mockup generator will have your download ready in no time. Create amazing mockup to showcase your app work and attract potential consumers! 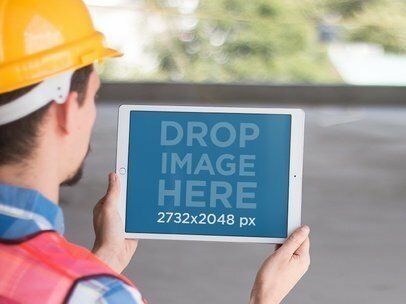 Display your new iOS app in this great construction app mockup featuring a civil engineer holding his iPad Mini in portrait position, great shot right? You can customize this mockup in just a few seconds by adding one of your own images onto the mockup template, our mockup generator will have your final download in no time! Save money and time with this great marketing mockup tool! 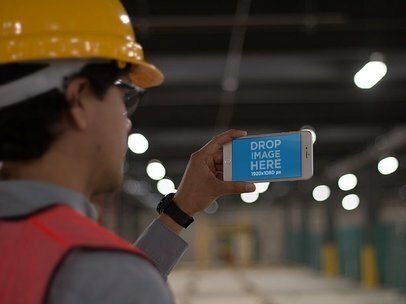 Are your ready to launch your new construction app? This is the perfect digital mockup to fit your work in! Simply add your image over the placeholder now and our generator will have your download ready in no time. Try out more photo mockups to promote your iOS app in a more appealing way to your potential consumers, what are you waiting for? Start customizing now! Make your new construction pp captivate your consumer's at a glance! 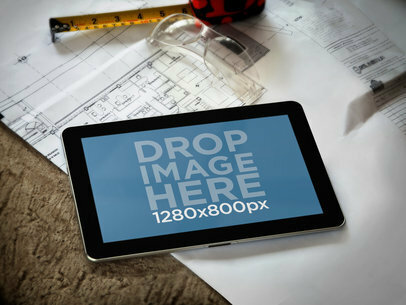 Use this digital mockup featuring an architect using his iPad mini in landscape position, nice shot right? Promote your latest work with digital templates and never regret leaving Photoshop, it's super easy and cheaper to customize your own mockup templates. Simply drag and drop your image over the placeholder now and you'll have a download in no time! 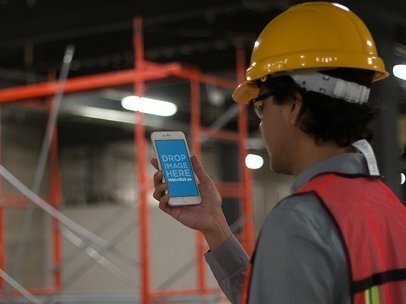 Use this great mockup of a white iPhone 6 held by a construction worker near site to display your new construction app! You can customize this digital mockup in no time by using our mockup generator, simply drag and drop an image of your choice over the placeholder and our mockup tool will adjust everything automatically for you. This is a great iPhone 6 mockup template which features a young man using his black iPhone 6 in a portrait position while working at a construction site. This workplace mockup is the perfect template for you to display your new iOS app in a clever manner that will create a compelling visual asset for your app marketing campaign. Try this black iPhone 6 stock photo right away and keep in mind you can add text to the negative space in the image. A civil engineering or architecture website? This stage will compliment your design. It is a Samsung Galaxy mockup over blueprints on a concrete table. The usable area is 1280&#215;800 px. You can upload an image or choose a website to display. If you target audience works in the construction industry, this is your stage. Showcase a new app for the handy man on this iPad mockup being used at a construction site. The iPad lays on a wooden table with tools and blueprints around it. The iPad is being touched by a man who is holding the blueprint. The iPad is in landscape view and holds an image of 1024x768px. A construction desk, some blueprints, a pen, a drill and a black iPad mockup. If you have a DIY audience, this stage should compliment your design. You can upload a 1024&#215;768 px image to start, or choose a URL.